Any whistlestop tour through the wine regions of the Italian peninsula is bound to leave someone unhappy because their particular favourite has been excluded. And possibly no stage is going to be more precarious in terms of bruised egos than the trip down from Piedmont to Tuscany taking a detour east along the way to include Trentino-Alto Adige and Friuli-Venezia Giulia, close to the Austrian border, and further south the gastronomic powerhouse of Emilia-Romagna. Piedmont is one of the nation's great wine regions, laying claim to some of the most characterful and robust reds to be found on the peninsula - which is no bad thing when they have to be strong enough to accompany indigenous dishes such as the combination of garlic and anchovies in bagna cauda. 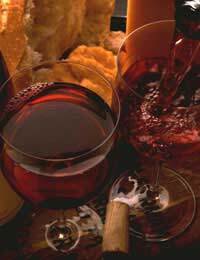 Three main grape varieties dominate in terms of red wine: nebbiolo, barbera and dolcetto. Nebbiolo is the most famous, believed to derive its name from the time of year it is harvested, when the first nebbie, or fogs, of the autumn descend on the region. It is the foundation for Barolo, Barbaresco and the lesser known Sizzano and Carema wines. The towns of Asti and Alba both lend their names to wines produced using barbera and dolcetto. The latter, incidentally, is reputed to take its name from the sweetness of the mature grape when eaten. White wines from the region include the straw-coloured Cortese di gavi, available as both frizzante and spumante as well as still, referred to as either tranquillo or fermo, and the dessert wine made from the moscato grape produced around the town of Asti and best drunk at a young age. Piedmont's near neighbour Lombardy has two notable areas of production, Valtellina and Franciacorta. The former is most famous for its Superiore red made from nebbiolo grapes. Try a glass with another local speciality, cured beef or bresaola. Franciacorta, in the south-east of the region, is famous for its sparkling wines as well as fermo varieties such as Manca Pane, the name “lacking bread” deriving from the fact that the soil while unsuitable for growing cereals was ideal for vines. The Veneto is one of Italy's most prodigious sources of wine, but quantity has not resulted in any compromise in terms of quality. Try for example the region's most famous white, soave, made from garganega grapes, perhaps a fruity red such as a Bardolino, which utilises the same corvina grape as Valpolicella. Other grape varieties used in the production of Valpolicella and its more robust cousins, Recioto della Valpolicella and the mighty Amarone, are molinara and rondinella. To the north in Trentino-Alto Adige, more common grape varieties such as chardonnay and pinot bianco jostle for position with others that reflect the region's proximity to central Europe, such as müller-thurgau and riesling. Cabernet sauvignon and traminer, the equivalent of gewürztraminer, are two varieties involved in the production of the reds of Friuli-Venezia Giulia, while chardonnay and pinot bianco again contribute to the output of white wine. So to Emilia-Romagna where among the whites can be found the dry fermo Pignoletto Classico that takes its name from the local grape variety grown in the hills around the city of Bologna, and one of several sparkling reds produced from the Lambrusco grape that complement many of the region's famous meat and pasta dishes. Crossing finally to the Mediterranean side of the peninsula, Liguria's reds utilise the dolcetto and sangiovese grapes made famous by its neighbouring regions, Piedmont and Tuscany, respectively. White wines take up plenty of space on Ligurian wine lists, not least because they complement the abundance of seafood dishes that are the fruits of the region's bountiful coastline. In terms of white grape varieties, pigato and vermentino are worth seeking out.